“McGowan’s music strives for an idiom in which various musics – American popular, European classical and avant-garde, Carnatic, a fascination with proportionally intricate rhythms, the use of microtones in the search for new subtleties of melody – and many others, rub against each other and generate new meanings.” This is how musicologist Bob Gilmore describes composer and flutist Ned McGowan. Born in the United States in 1970 and living in the Netherlands since 1994, McGowan has built his career by collaborating closely with ensembles such as the Axyz Ensemble, Calefax, the Zephyr Quartet and Hexnut. Then, in 2007, his specific fascination with Carnatic music led to a series of extended stays in India studying performance, rhythm and composition. “What fascinates me is the Carnatic use of rhythmical complexities developed through a tradition of performance.” This is clear in McGowan’s music, and emerges in his strong focus on rhythmically driven, technically virtuosic pieces, which while “very complex in many ways, are especially well put together” (Hans van Lissum, 2007). But despite whatever complexity McGowan might write, his music is never bookish; it is written with both the performers and the listeners in mind. In his debut in Carnegie Hall with the American Composers Orchestra, he “proved there’s still plenty of life in old-fashioned virtuosity with “Bantammer Swing,” a playful, athletic concerto for his unwieldy contrabass flute," according to Steve Smith of the New York Times. Similarly, Ned’s piece Tools, winner of the Henriette Bosmans Prize from the Dutch Composer’s Union GeNeCo, was described as “brutal and humorous” (GeNeCo, 2004), while at the same time “packed with discreet acoustic rooms, some more resonant than others, but all proving that... subtlety pays off” (Guy Livingston, Paris Transatlantic, 2006). Bantammer Swing and Tools are only some of pieces that have come into the public eye: Melting Igloos and Moonrise both made it to the final of the Gaudeamus Competition Prize. “Wood Burn [written for Calefax] grew to be the highpoint of the evening” (Mark van de Voort, the Brabants Dagblad). These and other compositions have been played throughout Europe, North Amercia and Australia, and at MATA Festival (New York), Ought-One (Vermont), Aspen Music Festival (Colorado), The American Music Week in Bulgaria, the Gaudeamus Music Week, the North Sea Jazz Festival, the Klap op de Vuurpijl, the Grachten Festival and the Karnatic Lab Festival (Amsterdam). 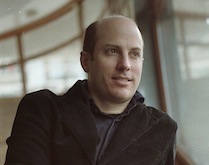 Ensembles and festivals that have commissioned McGowan include the American Composers Orchestra, Dutch Radio Chamber Orchestra (NPS / Dutch Music Days), the Zephyr String Quartet, Calefax reed quintet, the Axyz Ensemble, Duo Vertigo, the Netherlands Flute Orchestra and the Grachten and MATA festivals. Current commissions include the Pittsburgh New Music Ensemble, Piano Duo Post and Mulder and Trio Scordatura. Ned is also highly active in fostering the Amsterdam musical community through the Karnatic Lab Foundation, an organization he founded with Gijs Levelt in 1999 to promote both composed and improvised new music. Going strong after ten years, this Karnatic Lab runs a monthly concert series, has its own record label (Karnatic Lab Records) and house several ensembles, including McGowan’s own quintet, Hexnut. Hexnut is his special group that grew out of the original instrumentation for his piece Tools, plus a singer. They are “a tribe of dedicated musicians who perform the most fiendishly difficult rhythms with flair and ease…” (Paris Atlantic). The band reflects Ned’s affinity for the edgy, risky and yet extremely precise – the embodiment of “brutal and humorous.” It is a perfect example of the juxtaposition, assimilation and contradiction of styles within improvisation and composition that Ned is constantly inventing. In Hexnut, Ned is often seen behind his contrabass flute, which has become one of his specialties. Also in the mix are his more academic activities: since the 2009-10 academic season Ned teaches his own Carnatic Practices course to masters students at the at the Conservatory of Utrecht. Previous institutions he has taught at include the Conservatory of Amsterdam and the Amsterdamse Hogeschool voor de Kunsten. Between 2000 and 2005, he was also the director of the Dutch microtonal institute, the Huygens-Fokker Foundation, and now resides on its board.